A lovely island in the south of Italy in the Gulf of Naples. It is known for its rugged landscape, beach resorts and fashionable shops selling handmade leather sandals and signature limoncello liqueur. 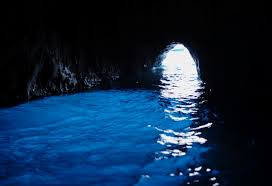 Here you can find the Blue Grotto which is a dark cavern in the sea where the sea glows an electric blue as the sun passes through an underwater cave. 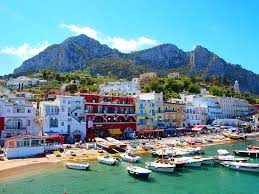 Capri is a popular day-trip destination from other Italian cities and a favorite of those on holiday in the summer. 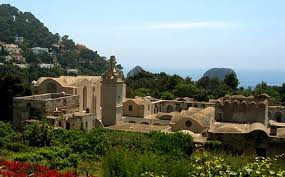 The two main centers on the island are Capri Town and Anacapri. Here you can see amazing grand villas, lovely gardens and banks that have brightly colored bougainvillea. 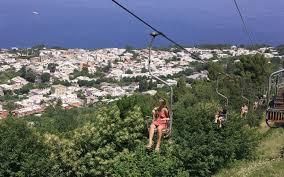 The best way to see all around far and wide is by going to the top of Capri’s highest peak Monte Solaro. It is easy to reach the top by taking the chairlift and you can get breathtaking views as you get higher and higher. From the very top it is possible to see the entire Bay of Naples, the Amalfi Coast and the islands of Ischia and Procida. At the top you can rest and relax at the cafeteria while enjoying the view all around. From the top to the bottom of the sea a famous tourist attraction is the Grotto Azzura. This is an amazing sea cave that is illuminated by a neon bright blue light. Local fishermen throughout time knew about this cave when in 1826 it was rediscovered by two Germans – writer Augustus Kopisch and painter Ernst Fries. What is really amazing is that this cave was around in 30 AD when Emperor Tiberius built a quay in the cave along with a nymphaeum. Today you can see the carved Roman landing stage at the back of the cave. This grotto has supposedly sunk by up to 20m in prehistoric times thereby blocking every opening except for a 1.3m high entrance. When the sunlight drifts through here is reflects on the water and a magical electric blue light shines. 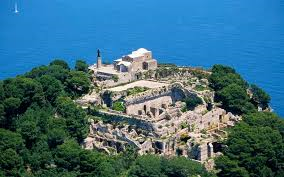 Visitors delight in seeing Villa Jovis which was the largest and most extravagant of the island’s 12 Roman villas. It was also Tiberius’ main Capri residence. Unfortunately today it is mostly in ruins. However it is a fascinating site to explore. In its day there was a problem getting water to the villa for its baths and 3000 sq. meter gardens. A complex canal system was built to be able to transport rainwater to four giant storage tanks the remains of which you can still see today. Of interest is the stairway found behind the villa that leads up to the 330m high Salto di Tiberio or Tiberius’ Leap. This is a sheer cliff from which supposedly Tiberius had those who had fallen from grace thrown into the sea. Not far from the villa is the Arco Naturale – a huge rock arch that was formed by the sea. Take a look at the Pop Gallery. Here in the showroom you can see modern sculptures and other art objects created by Italian artists. You can delight in art like sculpted heads with sea sponge hairdos in bright colors sculpted by Paolo Sandulli. A very picturesque monastery is Certosa di San Giacomo and it is a wonderful example of Caprese architecture. Today it is home to a school, a library, a temporary exhibition space and a museum. In the museum you can see 17th century paintings. It is of interest to look at the two cloisters. In the church you can see 17th century frescoes. Visitors enjoy taking a look at the former home of Swedish doctor Axel Munthe – San Michele di Axel Munthe. This home was built on the site of the ruins of a Roman villa. 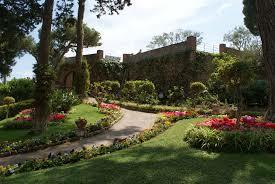 The gardens are lovely and just made for strolling and enjoying the flowers all around. There are Roman sculptures to enjoy. Visiting between July and September you can catch one of the classical concerts given in the gardens. 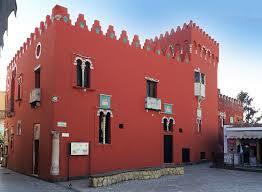 Impressive Moroccan-style “Red House” was built by an American colonel, John Clay Mackown in 1876. It was constructed around a 16th century defensive tower. Here you can see an eclectic collection of 19th century paintings among them scenes of Capri painted by Gonsalvo Carelli and by French painter Eduard Alexandre Sain with wonderful paintings like the “Wedding in Capri”. On display is also a colossal 1st century Roman statue that was discovered during excavations of the Blue Grotto. When you just want to relax and have a quiet stroll head for Giardini di Augusto. These are most colorful gardens located near the 14th century Certosa di San Giacomo. 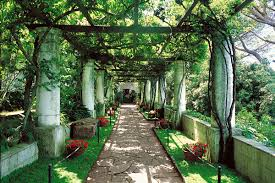 These wonderful gardens were founded by Emperor Augustus and they rise up on a series of flowered terraces offering breathtaking and spectacular views of the Isole Faraglioni – a group of three limestone stacks rising vertically right out of the sea. The Isole are home to a rare blue lizard. You can walk down a winding road from the gardens to Marina Piccola. On your way you’ll pass a bust of Lenin which it seems no one knows who put it there and why.